“Hundreds of Chadian troops moved into Gamboru this morning from Fotokol,” said Babagana Karimbe, who lives in the town in northern Cameroon which is separated from Gamboru by a bridge. 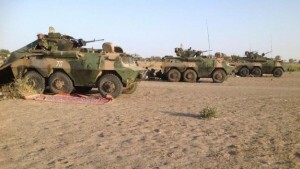 Troops from Chad were credited last month with liberating Gamboru in Borno state from Boko Haram control but the Chadians’ withdrawal from Nigeria last week appeared to have left the town exposed. The Islamists returned on Wednesday, killing eight people, while three more were killed on Thursday. “They are now in Gamboru. It is clear Boko Haram gunmen had fled before the troops deployed because we have not heard a single shot since the Chadian soldiers moved in,” he added. The lack of security presence exposed an apparent lack of coordination between the allies, whose sustained offensive has led to the recapture of dozens of towns in northeast Nigeria. Chadian troops had pushed into Nigerian territory after freeing Gamboru, going on to retake the Borno town of Dikwa, near Boko Haram’s Sambisa Forest stronghold. Fotokol resident Umar Ari said by telephone that Gamboru residents welcomed the soldiers with clapping and cheering, supporting Karimbe’s account that no shots were fired. “From Gardumba neighbourhood (on the outskirts of Fotokol) we can see the Chadian soldiers moving around Gamboru but we have not seen any Boko Haram gunmen,” he added. “We catch glimpses of Boko Haram ‎gunmen whenever they are in Gamboru. On Wednesday we saw them riding around Gamboru on motorcycles brandishing guns”. The regional offensive involving Nigerian troops, Chad, Cameroon and Niger was cited as a reason for postponing the Nigerian general election, which was initially scheduled for February 14. Nigeria security lackluster attitude appalling… Boarder towns deserted because no corrupt avenues or just military vacating their posts , an act ofi insubordination? What a shame. With news of many towns being liberated , the DD has been telling lies about the magnitude of the failure of the army. Same ad still cannot hold on to protect lives? No head is rolling for these lapses? Seems the Nigerian army is nowhere to be seen in this article ? Chadian troops liberated the town ,Chadian troops leave . So why didn’t the Nigerian army rush in troops to guard the town ? It seems mercenaries and foreign troops are fighting the whole war against Boko Haram . The Nigerian troops seem to be be unable to fight or understand what to do to protect the people of Nigeria. Chadian troops were asked to leave by the Nigerian government. There is a regional force composed of Cameroon, Chad and Niger but Nigeria’s lack of cooperation is hindering its action. When will the Nigerian government stop sacrificing their people?